Leaving Berkeley in mid-afternoon, I grabbed a quick bite in Mariposa and made it up to Glacier Point just after sunset. There was still some light to see what I was doing. I took advantage of the last light to establish my tripod and make some shots I could use to layer in foreground detail. 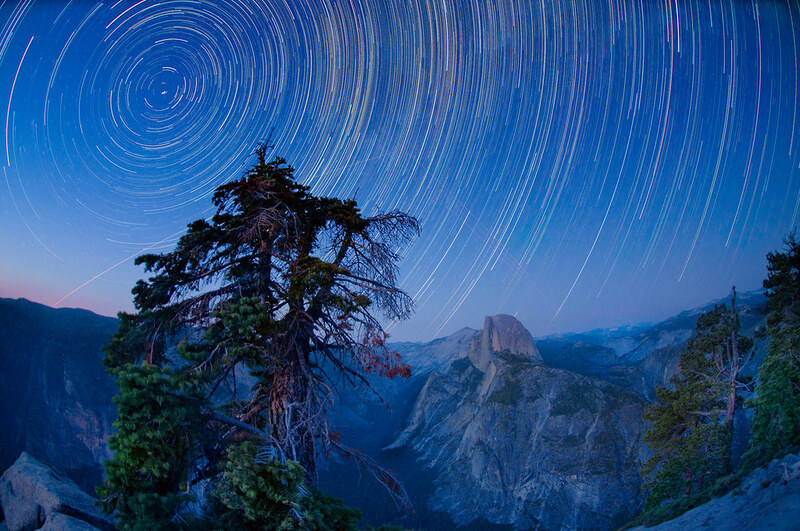 The night was balmy, and a surprising number of people showed up on Glacier Point to watch the night sky like a movie. One family even brought popcorn. As it grew darker, I switched from manual exposure control to my programmable intervalometer (a fancy word for a timer). By about midnight, the crowds had gone home and I was the last one left to witness the immensities of Yosemite Valley and the night sky. 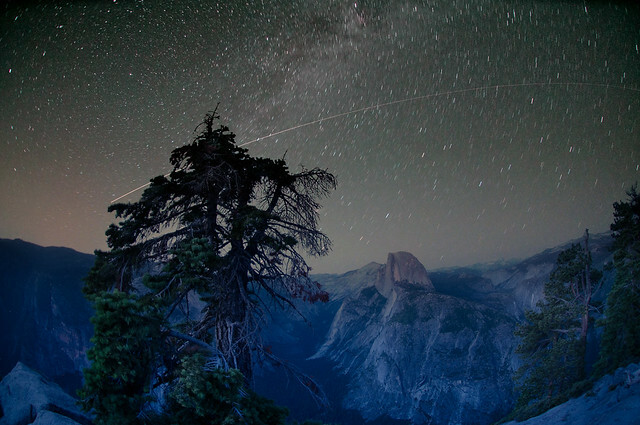 Besides the stars and Milky Way I saw satellites and a surprising number of planes on a flight path across Yosemite Valley. I also witnessed several dramatic shooting stars—including the one captured in the frame below. Using my 10.5mm digital fisheye, to capture these star trails I made 39 exposures, with each exposure open for a shutter speed of four minutes at f/2.8 and ISO 320. My total exposure time was thusly about 2 hours and 40 minutes. I combined the exposures in Photoshop using the Statistics script and a smart-object layer stack with the method set to Maximum. When I thought I’d captured enough, I crawled into my van in the parking lot, and grabbed a few hours sleep—ready to photograph at sunrise in a few hours. Want to learn to make photos like this one? Consider joining Steven Christenson and myself in November at Star Circle Academy. 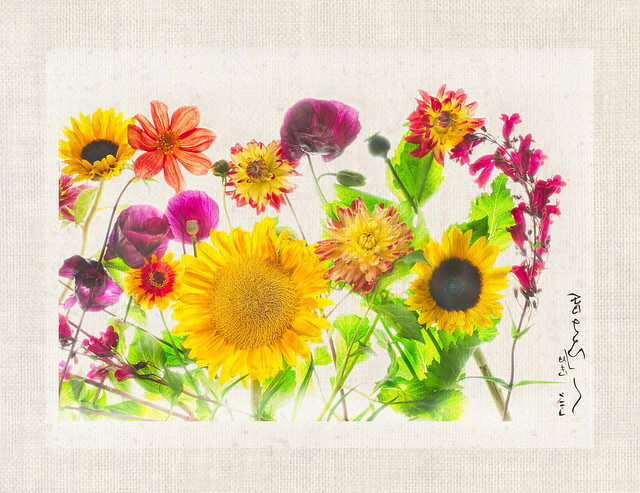 This is a floral HDR panorama, meaning I shot it in two horizontal pieces planning to stitch the pieces together. 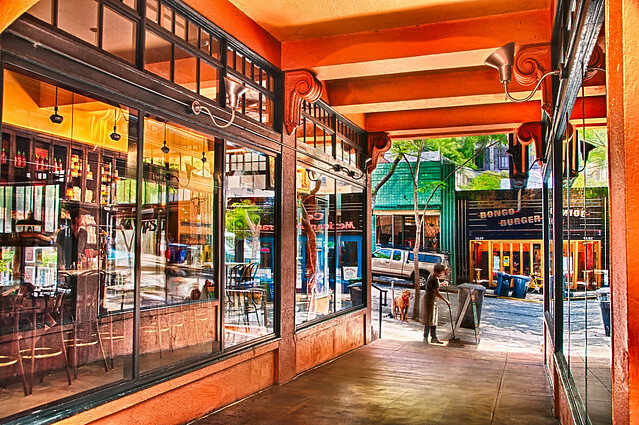 The logistics of this were somewhat complex—as with any HDR pano—given that each piece needed six exposures. 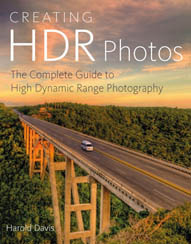 The idea behind HDR is to extend dynamic range, usually by shooting multiple exposures and combining the dynamic ranges of the individual exposures in the final result. Proceeding this way with each portion of a panorama leads to a fairly intricate workflow. In this case, I arranged the flowers horizontally on my lightbox and shot straight down with the camera on a tripod. I used a 50mm macro lens set to f/14 for some depth-of-field with maximal lens sharpness. Each of the two panels was captured using six exposures at ISO 100: 1/6 of a second, 3/10 of a second, 1 second, 2 seconds, 4 seconds, and 10 seconds. 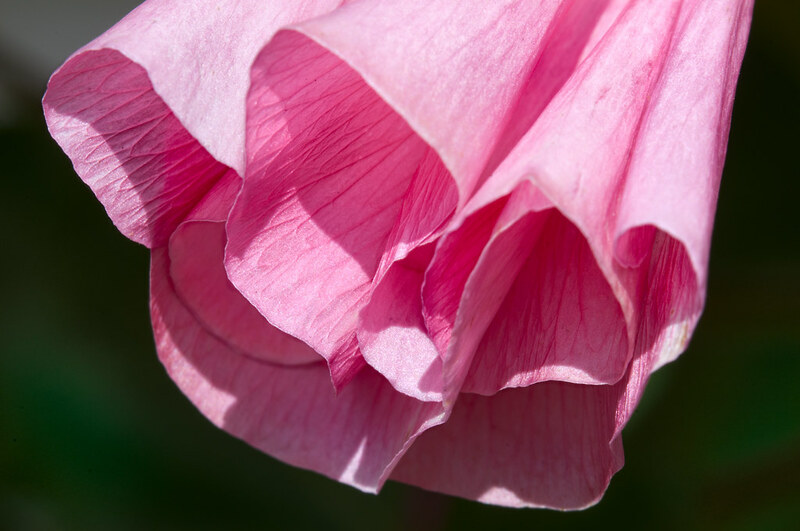 I primarily processed the captures using hand-layering, starting with the brightest capture to promote translucency, as I explain in Photographing Flowers. I also blended in at about 20% opacity a layer of automated HDR processing via Nik’s Merge to HDR Efex Pro. I created presets, and made notes, and was careful to process both sides of my incipient panorama in exactly the same way. In a “real-life” panorama—mostly outdoors in the landscape, or an interior architectural shot—one does more than 2 panels to be stitched. 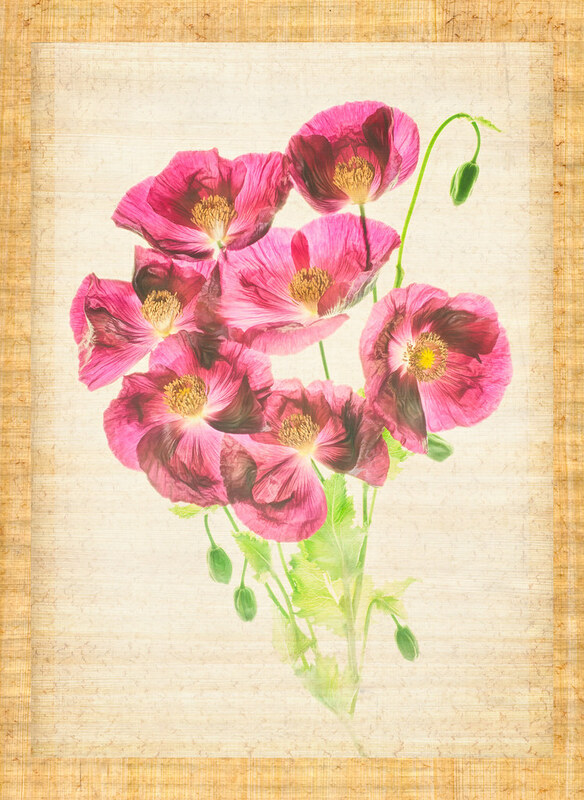 These are usually best executed vertically, not horizontally, include considerable overlap, and pivot around the nodal point of the camera and lens—not, as in this situation, created by physically moving the camera on its tripod from left to right to capture the other half of the flower-laden lightbox. 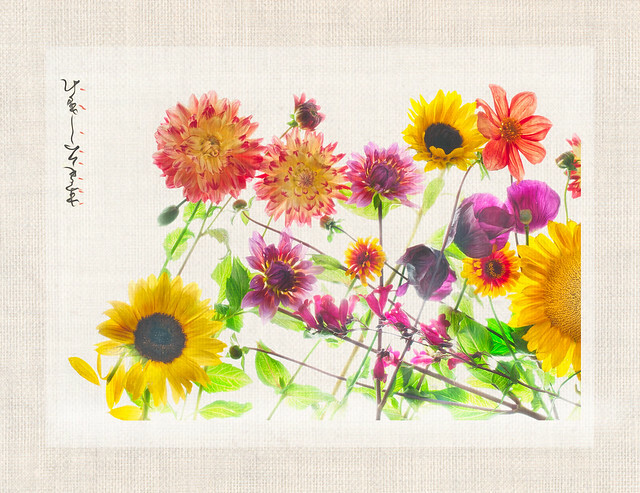 My overall idea in making a two-panel lightbox panorama was to create the sense in the viewer that there were more flowers in the image than could be visually absorbed in a single glance. So it is no wonder that when I came to put the two halves of my floral pano together that I ran into severe continuity and parallax problems. To give you the idea, with one flower stem lined up, then the rest would go out-of-register. Photoshop’s stitching software was an abject failure when I tried it; clearly, the algorithms had no idea what I was trying to do. When the going gets tough, the tough get going. With a little help from some caffeine. When automating software fails, it is time for the human beings to get back in control. Cloning, warping, resizing, duplicating layers and moving, and correcting perspective on small pieces put the two panels together—hopefully in a way that looks completely natural. The final result is an image that is close to twice as wide as a normal horizontal capture, roughly in a 2.8:1 proportion. The original file size is very high resolution, so there would be no reason not to print it, say, ten feet wide by about 30 inches high. Along the way, I created versions of each of the two frames, and added some “calligraphy”—shown above and below. My idea is that these two “half images” work individually, as a pair, or on either side of the panoramic version. 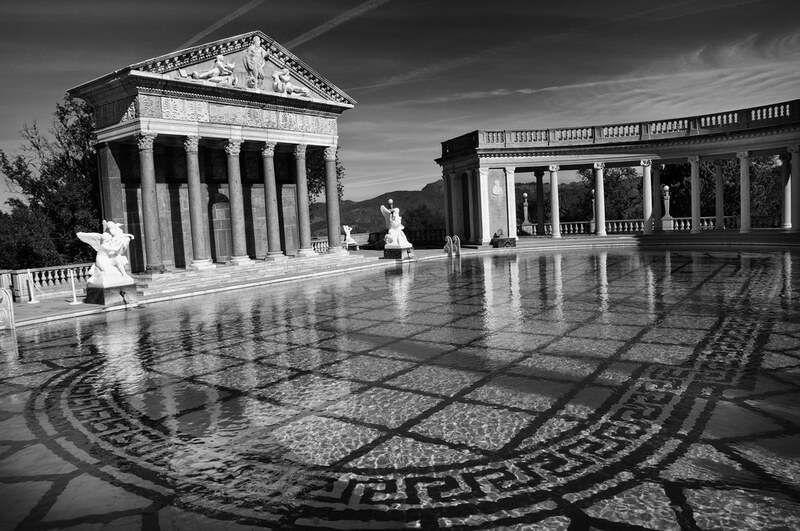 Briefly noted: Some scenes, like this shot of one of the swimming pools at Hearst Castle near San Simeon look more, well, classical when converted to classical monochromatic. Fancy that! You may be interested in some of my webcasts and video appearances that you can find online. These are all sponsored as noted in the listings, and free to watch. Please let me know what you think! 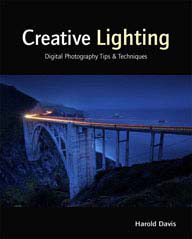 Upcoming: On Wednesday, August 18 I’ll be presenting a webcast sponsored by Focal Press explaining the Photoshop techniques behind the images in my new book Photographing Flowers. Please note the date if you are interested in participating live; otherwise a playback link will be available. Briefly noted: Photographing this mallow blossom unfurling, I was reminded of fabric. Ignoring issues of scale and context, this flower could be the bottom portion of an elaborate and stylish dress! The Indian Trail footpath runs down from our Thousand Oaks Berkeley neighborhood to The Alameda. This shortcut makes walking down to restaurants and shopping on the top of Solano Ave very quick. The kids and I often wander down The Indian Trail to get to the Thousand Oaks playground. There’s not much evidence of anything actually and historically Native American along the Indian Trail, although there is a shallow cave under a low overhanging rock that the kids love to inspect. These days, the Indian Trail winds past elegant mansions and luxurious gardens on its way down to the so-called “flats.” The tumble-down garage shown to the left of this 5-shot HDR composition is an exception to the pervasive sense of order and entitlement around here. Without this ramshackle out-building, the composition would not work—proving once again that what Lewis Carroll called sweetly pictaresque in rags beats clean modernity anytime, provided we don’t have to live in the rags. I shot this photo of Katie Rose in the garden the other day with my new 35mm f/1.8 Nikkor lens. This is essentially a very high-quality prosumer lens, and surprisingly inexpensive (about $200 street price) considering its quality. On a 1.5 sensor, such as the D300 I am using, this prime lens has an effective aperture of 52mm, roughly what we used to think of as a “normal” lens. The prime designation means that the lens does not vary in focal length (compared and contrasted to zoom lenses, which feature variable focal lengths). It does not mean that this lens is a cut of meat, or a number only divisable by itself or one. To make this casual portrait of my daughter, I got low to the ground. I set the camera to aperture-preferred metering, with the aperture wide-open at f/1.8. I knew the wide-open aperture would let plenty of light in for a fast exposure, which would “stop” the motion of Katie’s jaunt in the garden. The flat depth-of-field would also contrast the in-focus child with the our-of-focus garden. 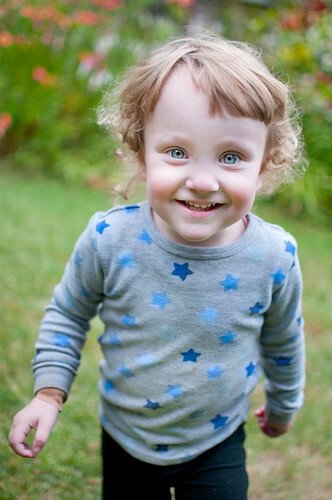 Then I focused on Katie’s eyes, and waited for precisely the right instant to release the shutter. Exif data: 35mm, 1/1600 of a second at f/1.8 and ISO 200, hand held. My special limited edition offer of Following the Path will end in a matter of days on July 31, 2011. 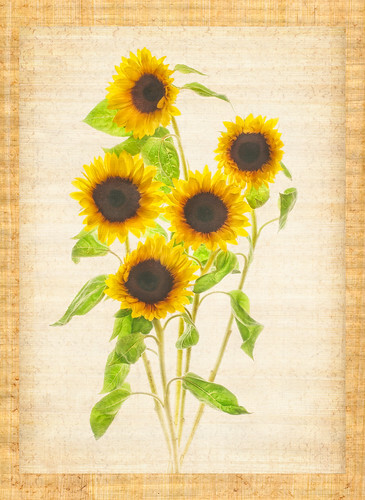 This print has a normal retail price of $450.00 but is available while supplies last for the special price of $195.00. Here’s the link if you are interesting in owning one of the prints in this edition, or want more information about the print. As with all prints that you purchase directly from me, I stand by my work. If you are not completely satisfied with my print when it arrives, and after you’ve had time to live with it, please return it to me for an exchange or refund. 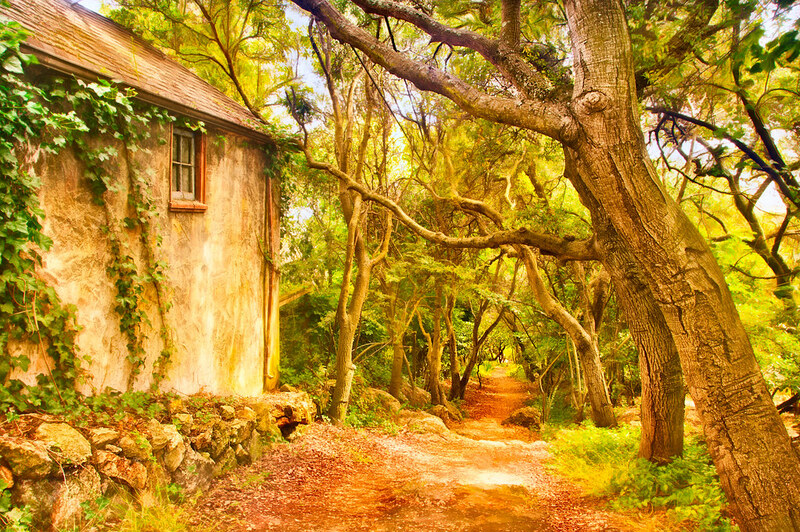 Following the Path has been hand-crafted in a limited edition of twenty prints. After this edition is sold-out, this print will not be offered again. Each print ships with a certificate of authenticity that I’ve signed, indicating its number in the edition. Purchase Following the Path now! 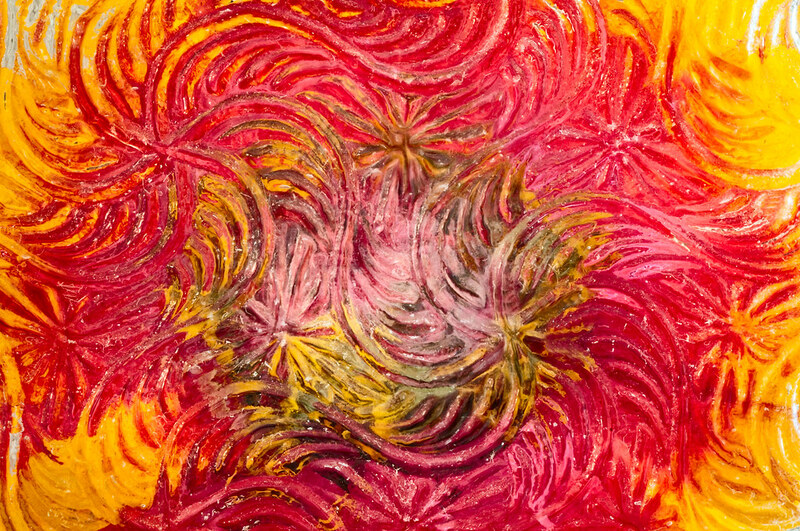 I am very excited that a number of my pieces in the style of this image of Papaver somniferum have been accepted into the publishing program at the World Art Group. The origins of this business go back to a company called Old World Prints. It’s not entirely clear where my work will fit in the mix of botanical reproductions and more contemporary photography that they publish because my work could be either. Recently we celebrated Mathew’s seventh birthday. 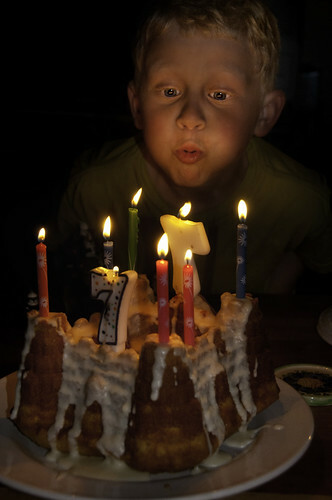 He is shown in this photo blowing out the candles on his birthday cake. Just in case you haven’t seen enough of my kids and want to give the others some equal time, here’s a link to the Kids category on my blog. My kids tell me that a T-Rex dinosaur is a relative of birds like a chicken or turkey, both being descendants of pteradactyls. 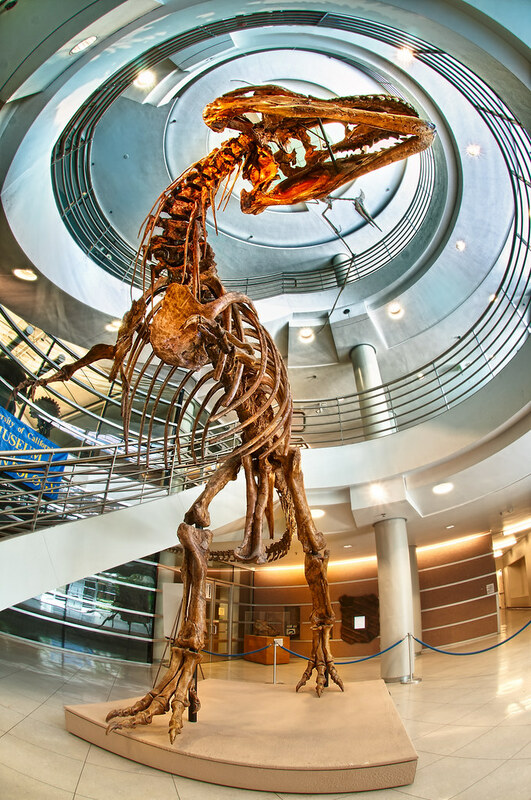 It’s a little hard for me to see the resemblance, but here’s the skeleton of the very big chicken that lives in the Life Sciences building on the UC Berkeley campus, shot using HDR. 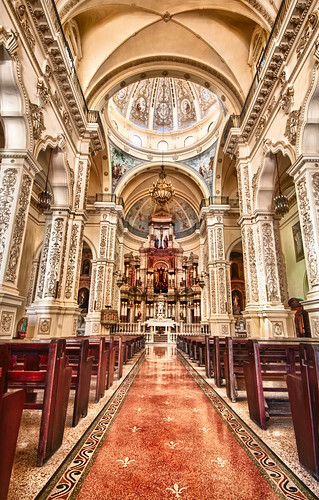 Many HDR photos involve strong contrast in lighting and a high tonal range. In this case, there wasn’t a great deal of contrast and I could have captured most of the tonal range in one exposure. The point of using HDR was to allow me flexibility in dealing with apparent color and lighting so I could make the T-Rex seem to pop out of the background. Over the weekend I spent some time with the kids wandering around and exploring the University of California at Berkeley campus, which is about half a mile from our home. We started at Northside, shown in this image, along Euclid Avenue. The boys were hungry, and we were headed for a slice of pizza at Lavals. 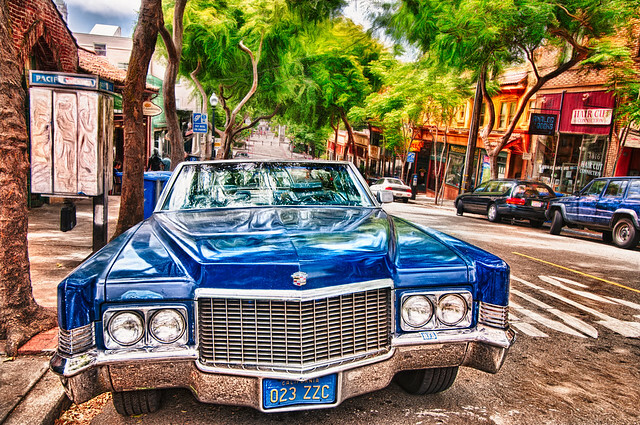 I managed to hold them off while I got out the tripod and fired off seven shots, bracketed by shutter speed, of this blue Cadillac. The good news: there was a nice courtyard and passage with reflections for me to shoot while they scarfed down their slices. I shot a number of sequences for HDR, and used a polarizer to amplify the reflections along the passage. Both images were processed in a pretty straightforward fashion using Nik Merge to HDR Pro as a Photoshop plugin. In a previous story, I noted the importance of looking behind one. Commentators added the great suggestions of looking up and down as well. A corollary to having the kind of “hungry eyes” that looks around the 360 degree world is to learn to exercise pre-visualization skills. A good way to start is by practicing visual make-believe. In other words, stop to consider what happens if you try something. Even if it is not something you would normally try. Particularly if it is not something you’d normally try. Case in point: The frosted glass pane in the upper half of our bathroom door was probably added in the 1940s or 1950s. I found myself wondering what it would be like to photograph a flower through the glass. What if I taped a flower behind this glass, opened the door to maximize the light on the flower, then used a macro lens to shoot the flower through the glass? The results are what you see, with minimal post-processing. As Phyllis finishes up the page layouts for Photographing Flowers, I’ve been spending a great deal of time with Katie Rose. Our nanny is on vacation, the boys are in camp, and Katie doesn’t start pre-school until September. Although I get impatient because of my list of things to be done, these days are precious to me. 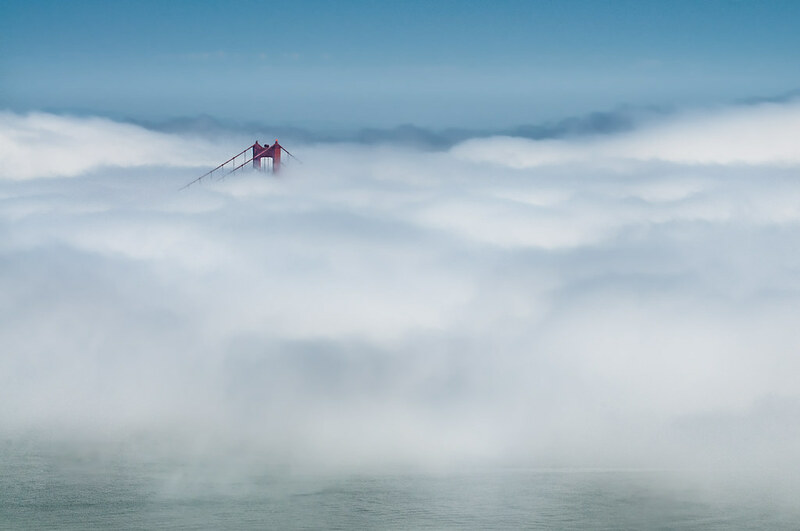 The past few days the fog has been coming in and out of San Francisco Bay as though driven by a bellows. We wake up inside a cloud, by midday everything is blue and sunny, then as the afternoon wears on the progression reverses. Katie and I went exploring. I was looking for interesting juxtapositions of fog and landscape. Katie was looking for playgrounds. We started at the Berkeley Marina, then crossed the Bay to Belvedere and Tiburon, on the edges of the fog. The playground in Belvedere met Katie’s expectations, but the fog didn’t quite do it for me. With an intermission to feed French fries to the pigeon at In-and-Out burger—he must have been on an intermission from driving the bus—we headed for the Marin Headlands with its views of the Golden Gate. Katie climbed Hawk Hill on her own steam, and I pulled out my 70-300mm Tamron lens to shoot this image of a lone tower of the Golden Gate Bridge in the late afternoon sea of fog. Someone commented that this photo shows the virtues of being in the right place at the right time. Maybe so—or perhaps the moral is to let your kids be the guide!